Shana Corey has the unique ability to make history accessible and fun, a talent that has been praised in all of her celebrated picture books, including MERMAID QUEEN, illustrated by Edwin Fotheringham and YOU FORGOT YOUR SKIRT, AMELIA BLOOMER!, illustrated by Chesley McLaren, which was named a Publishers Weekly Best Book of the Year and an Orbis Pictus Recommended Title. She lives in Brooklyn, New York. Hadley Hooper is an editorial artist whose work appears regularly in The New York Times. HERE COME THE GIRL SCOUTS! is her first picture book. She lives in Denver, Colorado. Did You Know These Amazing Facts about the Girl Scouts? * There are more than 3.2 million Girl Scouts throughout the world! *More than 50 million American women enjoyed Girl Scouting during their childhoods. 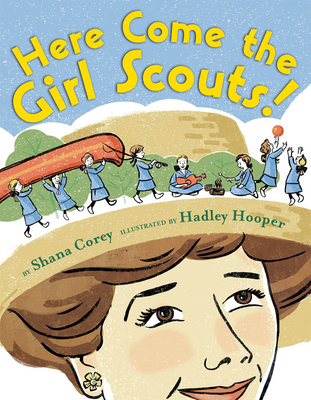 * March 2012 marked the 100th Anniversary of the Girl Scouts.